In late 2017, the Knowledge Translation Unit (KTU) decided to upgrade a their training database/application to a web-based system. The system was built as a Windows Forms application with a SQL Server database, and was doing its job reasonably well. However, the long term vision for the system was to devolve the data entry from a centralised approach (done in the KTU office) to a remote, web-based approach (done by the trainers themselves). Also, as KTU didn’t have access to the source code, they unable to make even the smallest change to the existing system. The KTU trains health care professionals on a range of different courses and topics. 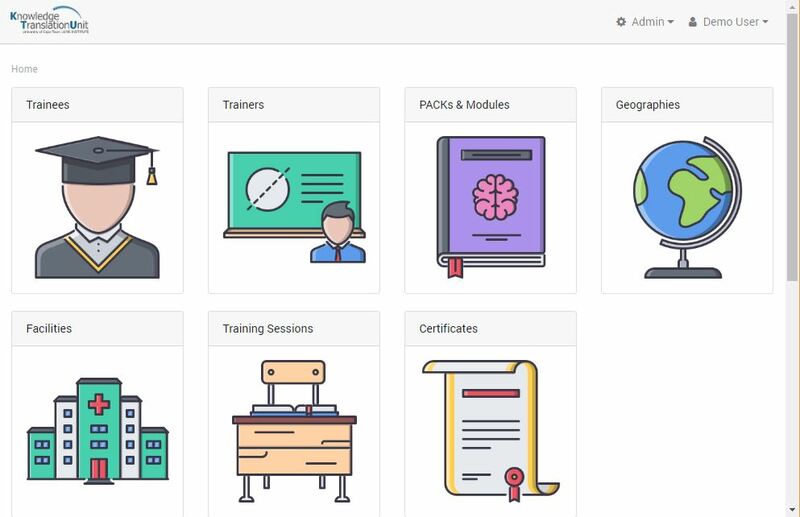 The training application stores this training data for all KTU’s trainers and trainees, and allows the KTU to keep track of who has done what training, when they are eligible for certification, and what the training coverage across facilities around the country. In April 2018, Phase 1 of the system was ready for handover to the KTU. This phase was mostly a port of the existing functionality to a web-based system, with a few minor changes. Phase 2 is intended to extend access to trainers and potentially trainees, who can view their training progress online.